For other uses, see Dongola (disambiguation). 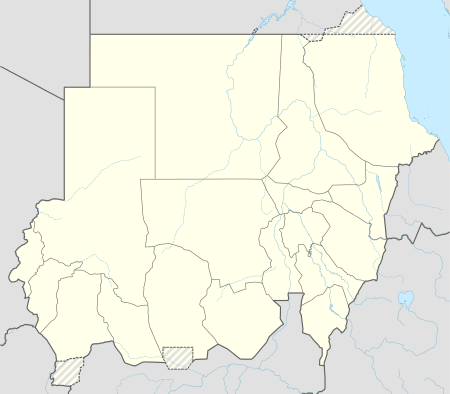 Dongola (Arabic: دنقلا‎‎ Dunqulā), also spelled Dunqulah, and formerly known as Al 'Urdi, is the capital of the state of Northern in Sudan, on the banks of the Nile, and a former Latin Catholic bishopric (14th century). It should not be confused with Old Dongola, an ancient city located 80 km upstream on the opposite bank. Dongola was the scene of a victory by General Herbert Kitchener over the indigenous Mahdist Muslim tribes in 1896. Dongola Road in the Bishopston area of Bristol was named after this event. So was Dongola Road in Tottenham, North London which runs next to Kitchener Road. There is also a Dongola Road in Jersey (Channel Islands). The Latin Catholic Diocese of Dongola was established in 1330 and suppressed in 1350. No incumbent is recorded. The Nile Expedition of 1884–1885 to relieve Gordon at Khartoum passed through the area. Regiments were challenged to race up the river by boat, and this gave rise to the English regatta competition of dongola racing. Dongola has a hot desert climate (Köppen climate classification BWh). Dongola is located in one of the hottest, sunniest and driest regions in the world. ↑ "Dongola Climate Normals 1961–1990". National Oceanic and Atmospheric Administration. Retrieved April 23, 2015. ↑ "University of Dongala". University of Dongala. Retrieved 2011-09-17. Wikimedia Commons has media related to Dongola. "Dongola, Sudan: Climate, Global Warming, and Daylight Charts and Data". Climatecharts.com. Accessed September 2010.